Cooking Smoke Kills women and children... but we have a solution! 8. Empower the user through non-monetised sharing of ideas! According to World Health Organization (WHO) estimates, and more than 800 million people are impacted by exposure to HAP (Household Air Pollution). "Regular exposure to smoke from cooking and heating fires is directly linked to severe health impacts, with an estimated eight people per minute (some 4.3 million per year) dying globally from it, accounting for more deaths each year than AIDS, malaria, and tuberculosis combined." "...give a woman a fish, her family eats for a day, teach her to fish and her family eats for life". 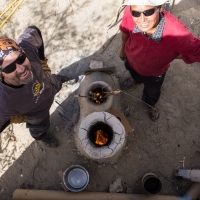 We have developed a smokeless cookstove that can be made by anyone with readily available materials (dirt, clay, straw, water and a puffed grain). We have worked up a new concept in a production factory (at Himalayan Rocket Stove, a Social Enterprise that is supporting us in India) to make kits that have everything needed for someone to make their own smokeless cookstoves. We call this the Smokeless Chulha Kit, something that you can buy here and we will see that it is delivered to a needy family or a suitably located organisation to use where it is most needed. We can also send you a kit anywhere in the world! We'll work out the postage and add that to the total and this kit can be yours, or sent to your favourite organisation anywhere you like. The trick to making smokeless fire is in the design and the addition of a puffed grain to the clay, such as puffed rice. In simple terms we are teaching people to make insulated burn tubes that are highly efficient as they get hot enough to burn smoke, resulting in a clean burn and requiring far less fuel. They are too simple and too effective to not be used. 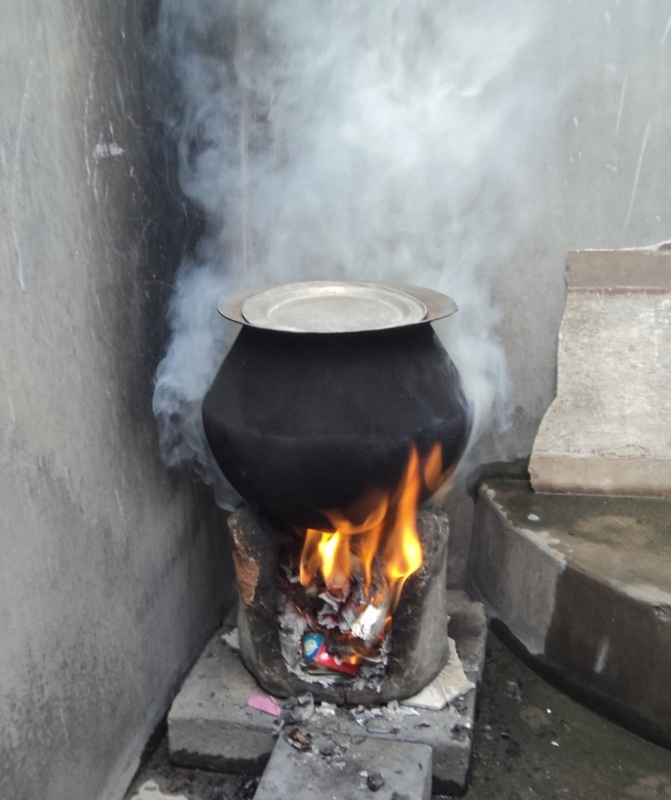 Not only are they relatively smokeless (about 90% less than usual), they are also highly efficient using 50% or less of the fuel required for a conventional cookstove. Funds raised through selling the kits have a double benifit. Firstly, we either send you the kit if you want it, or preferably, we send it to the field where it will get used in a needy situation. Secondly, the surplus funds raised though the sale of kits is channelled 100% towards our training programs in the field. These programs are designed to teach villagers to make their own chulhas and to train up regional trainers who are then sent out to their respective regions to train more people in making these stoves. The stoves themselves will cost nothing to make, but the kits make it easier for people to make lots of stoves. Let us train the trainers and let them loose on the world. We aim to start a Smokeless Cookstove Revolution by giving everyone the skills to make their own. 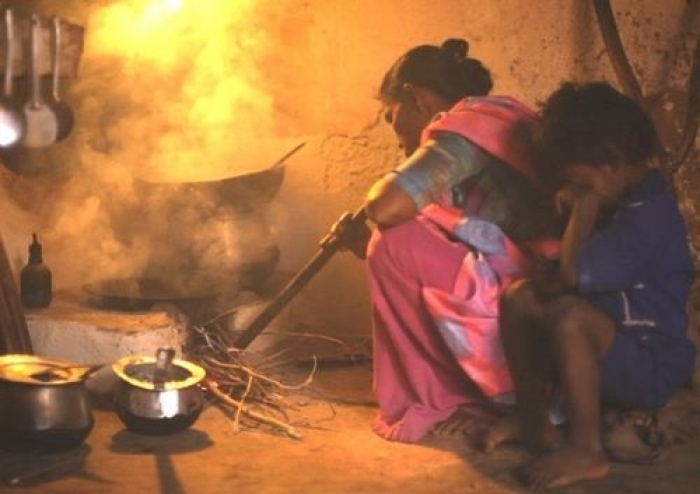 Learn more about the amazing work being done by the Smokeless Cookstove Foundation (SCF), a registered not-for-profit in India that has achieved incredible results using these methods in the field. Send an email if you want us to put someone else's name on the page. Thanks to Aangi Shah for the incredible images from a recent field trip by SCF. Smoke from cooking fire kills millions each year. This project teaches people how to make their own smokeless cookstoves in regional India and empowers them to teach others to do the same. When you fund a kit here, we make sure it goes to a needy person/village/organisation in a region where it will make an impact for good, and send you a Certificate of Thanks by email you can give to someone for Christmas. Give a gift that keeps on giving... We'll make sure these kits are delivered to a location that needs them, and send you a Certificate of Thanks by email you can give to someone for Christmas. When you fund this option, we locate and a train up an NGO to use these kits in their region, ensuring maximum impact on the ground where it is most needed and send you a Certificate of Thanks by email you can give to someone for Christmas. By funding this option, we can equip a full training module run by the Smokeless Cookstove Foundation with the equipment they need to get all the trainees set up with their own kits. This is a super high impact option that facilitates hundreds of smokeless cookstoves being made every month for an ongoing period. When you fund this option, we will pack and send 1 Kit to any address in the world by courier. This could be for you, or it could be for a friend or an organisation you would like to see exposed to this incredible way of changing lives. This helps us spread the Smokeless Cookstove Revolution far and wide! * $10,270 in offline donations included in total.